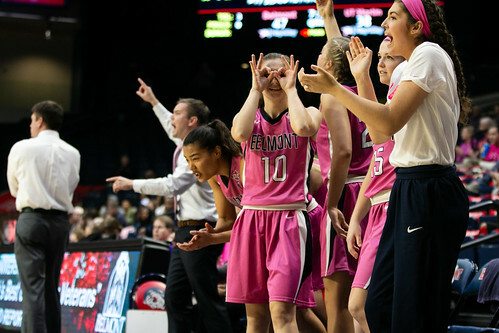 The Belmont women’s basketball team defeated UT Martin 100-86 at the Curb Event Center on Saturday evening in the Bruins’ highest scoring game of the season so far. The Bruins’ offense was nothing short of electric in this 2018 Ohio Valley Conference Tournament championship rematch. Junior Ellie Harmeyer showed off her talent from all over the court, picking up a double-double with 30 points and 10 rebounds. Harmeyer shot 3-6 from behind the arch. Senior Jenny Roy only scored 2 points but had 20 rebounds. This was the first time a Belmont women’s player assisted 20 or more since 2007. Senior Darby Maggard had another great game in her OVC MVP-caliber season, scoring 24 points, with 6 of them coming from behind the 3-point line. UT Martin’s defense struggled early on but picked up late in the first half and early in the third quarter. The team’s heavy man-to-man, full-court defense allowed the Skyhawks to force turnovers and quick shots from the Bruins. But this wasn’t enough to stop players like Maggard, Harmeyer and freshman Jamilyn Kinney from hitting six triples within the first seven minutes of the third quarter. Kinney scored a career high 14 points, 12 of which came from the 3-point line. Juniors Maddie Wright and Maura Muensterman both performed excellently. Wright scored 12 points and rebounded six. Muensterman scored 14 points and shot 4-7 from the arch. The Bruins improved their record to 9-1 in the OVC and 15-5 overall. Belmont will play its next four games on the road, starting at Eastern Kentucky on Thursday at 4 p.m..